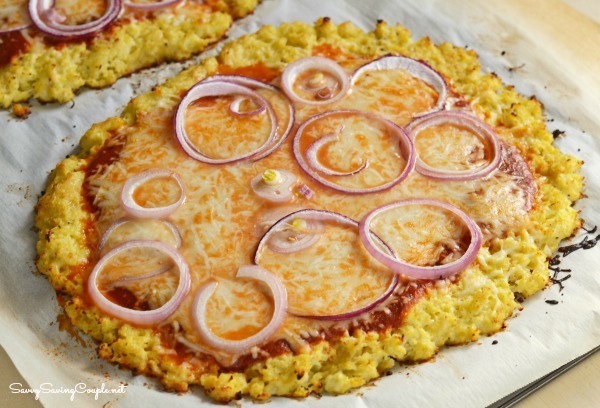 Want a delicious recipe for keto-friendly, gluten-free cauliflower crust pizza? This recipe is easy and super flavorful for your next keto pizza! This keto pizza crust recipe is a must-try for anyone looking to eat less white carbs. Made from fresh cauliflower, Parmesan cheese, and spices; this is sure to be a hit with your family. Plus, it is not going to break the carb bank! I was able to shed 17 lbs in one month on the keto diet and really found it to be pretty easy to follow once I got over the sugar detox! I loved being able to eat lots of avocado, cheese, and greens! One thing I did miss was pizza though! Pizza is life around here so I had to revisit this cauliflower pizza crust recipe. 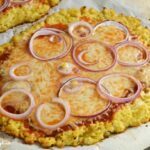 This cauliflower pizza crust is perfect for those of you doing the keto diet because cauliflower is low in net carbs. Pair it with some reduced sugar marinara, and a think sprinkling of red onion (since onions do have more net carbs than I’d like) and you have a tasty meal! Grate both heads of cauliflower until you get four solid cups. Add cauliflower to a large glass bowl and microwave for 10 minutes. I suggest using a paper towel to make a steaming effect. Return to oven for another 10-15 minutes. Your edge may look a little well done, but that is due to the cheese in the mixture. Serve your low carb cauliflower pizza with a nice healthy side salad. Want another Keto-Friendly Pizza option that is not fathead dough or cauliflower pizza crust? Check out these Mini Eggplant Pepperoni Pizzas.